The lands of d'Meloni sit to the far east of the county, guarding the Aequorian side of the mountain pass that leads through the final barrier between Hellsmouth County and the Vir Sidus lines. These lands were mountainous and often difficult. In the days since the pass was closed d’Meloni primarily herded sheep and managed small amounts of terraced croplands. They produced a particularly good quality wool-felt that had excellent water repellent qualities. In the years before the Qatunax invaded, ending House d'Meloni, they had fallen in grace due to malfeasance. 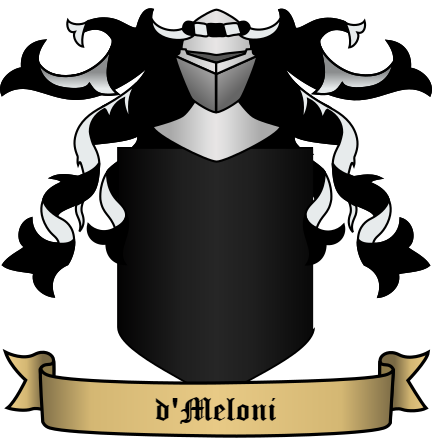 The main holding of d'Meloni is the city of Cotswold, where the House castle and main keep are located. The city and lands of d'Meloni were conquered by the Qatunax in 1873, but reclaimed by the Vir Sidus Empire in Marse, 1875. The city and all of its holdings were returned to the last remaining d'Meloni of the main line, Alia d'Meloni by the Praetor Darius Firebrand, and established as a colonia of Vir Sidus Empire. Reconstruction has begun on the city as well as its holdings. The pass through the mountains are also in the process of being cleared, to allow transit through the mountains and into the lands of the rest of the Vir Sidus Empire. Alia d'Meloni (26, b. 1848): Currently, the only known survivor of the main line of House d'Meloni. Escaped the death of her House only due to the fact that she was studying at the College of Alchemy in Four Corners at the time of the Qatunax invasion and occupation. Sir Anton d'Meloni of Ramsgate (NPC): A Horned Knight who was raised to a landed Lordship by Viscount Ludovic d'Korbina and given command of Elm's Ridge, a fortress along the line of demarcation between the lands of Hellsmouth and the occupied territory of the Qatunax.